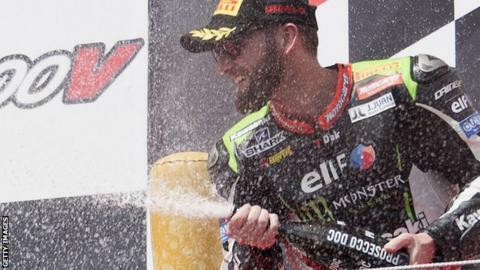 Tom Sykes secured his ninth straight victory at Donington Park as he comfortably won the first race of the World Superbikes UK round on Saturday. The English rider was battling team-mate and series leader Jonathan Rea before the Northern Irishman crashed out with three laps left. Sykes has moved up to second and has cut the gap to Rea to 50 points. Leon Haslam was second with Alex Lowes third, while Wales' Chaz Davies, who led before slipping off, was eighth. Marco Melandri, Marco van der Mark and Leon Camier completed the top six with Northern Ireland's Eugene Laverty in 13th. Sykes was on pole but Davies moved up from third to lead going into the first corner. Rea applied the early pressure on Davies and the defending champion moved to the front when Davies came off at Goddards. Davies, who won both races in the last round at Imola, managed to rejoin the race - but his hopes of a podium pace were over. Sykes reeled in Rea before taking the lead and surging clear with seven laps left as his Kawasaki team-mate struggled to keep in touch. Rea appeared to have mechanical problems before he escaped injury in the late crash. Sykes eased to victory and replaced Davies as the closest challenger to Rea going into Sunday's second race at the English circuit.